For followers of this blog that have not yet seen my new site, you can visit http://www.guscosio.com for new updates. Thank you. For regular followers, you can now find my market views and comments at http://www.guscosio.com. Hope to see you there. I am now in the process of developing a new site which I hope can block out disruptive activities. I plan to have the first post by Monday. Please check again with this site for the new site address. I am just testing it for administration. i am not that tech savvy so it is taking me sometime to familiarize with the site. Bear with me a little more. P.S. 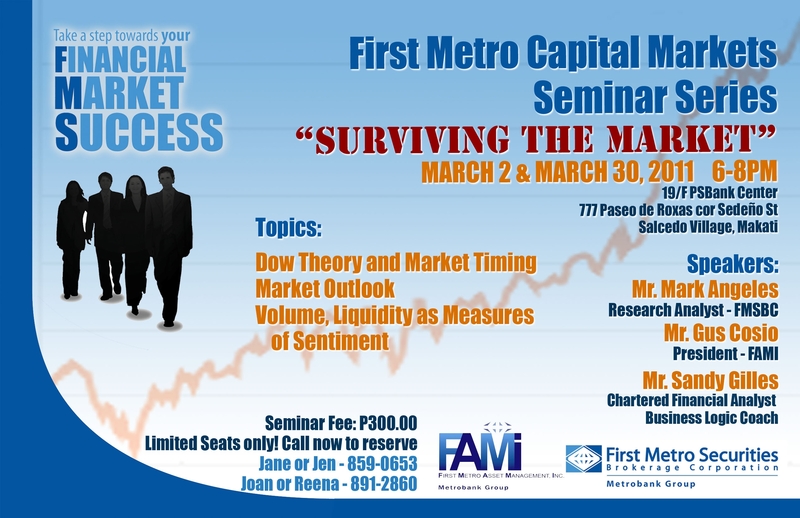 For Cebu followers, i will be emceeing the Cebu launch of firstmetrosec.com.ph on-line trading in Cebu on the 17th of March. Those who want to be invited, you can send me you names and a few details at guscosio@yahoo.com although I confess that will have to screen you first. Please email me asap so I can work on it. Poser, hacker, whoever you are, I know how to find you! I am truly moved by the regrets and lamentations about my plan to discontinue this WordPress blog. I surmise that my reaction to the hacking-related disruptions was rather too haste and emotional. After several days of reflection, I have realized that there is no reason at all to stop my advocacy. With the help of your persistent demand, I therefore recant my earlier decision; this blog will move on despite the littering. I have faith in the good intentions of most readers and will use that faith as guide to discerning which comments and remarks are noteworthy and deserving of attention. Thank you all for your support and I deeply apologize for raising the level of anxiety among those who closely follow my blog. These comments came from IP: 62.75.211.32 , sl1211032.startvps.com which is not my IP address. Now I know where the poser is coming from and I will try to seek him/her out. I ceased my posting knowing that this demon will come out with something as lame as this. This person was not as smart as I thought. If I were to change my mind about the blog, would I not have done it through a new post and not in merely a comment box? To the poser or hacker or whoever you are, wherever you are, I will find a way to block you. If I find you in person, I just would like to inform you that we have internet laws in this country that deals with internet fraud which you are committing. I will find you and have you arrested according to local and international Cyber Space Laws which deal with felonious characters like you. For all of those who plan to follow this blog, I am consulting with some programmers to see how I can re-start “Gus Cosio Says So” but in a different protocol. Please go to this page after a week to give me time to come up with a more secure environment. I hope you understand that I am merely trying to keep the integrity of my site. I cannot afford having other people giving counterfeit concepts in this site that are not a t all mine. Bear with me a little longer, after all the local market will not be running away from us in the near term. I am planning to discontinue this blog because somebody has been posting comments in my name. I do not want to be misquoted or misrepresented by others as I have my business and reputation to preserve. There are even people who I think use this space even to subtly insult me. I just do not want to give you satisfaction. It is not worth my effort. I will, nevertheless, continue my investment literacy advocacy through other means such as seminars conducted by my firm and affiliates or other organizations which invite me to speak in their assemblies. For those who want to continue to follow, you’ll know how to keep in touch. I will resume my blogging when I find a secure way of managing it and find the time to do it. In the meantime, this blog space will exist only for my personal announcements. For regular followers, I am sorry. For people who only seek to destroy, you’ve succeeded. My question is, what now? Did it make you a better person? The disruptive action on this blog is starting to get severe that even my name is being used by a gremlin comment writer. I think he or she has written comments with my name twice. I will choose to ignore this person and the mischief that he or she is trying to foment. I have a fundamental purpose is making this blog flourish and whoever is trying to sabotage the longevity of this blog will not discourage me from doing so. I would suggest that legitimate followers be discerning in following comments. If the tone or language appears to be condescending, impolite or vulgar, then just ignore it. From this day forward, I will try to be more vigilant in reading comments. I will erase any foul or vulgar language or snide remarks that appear offensive and mark it as spam. In the meantime, to those of you who find this space useful, bear with me and understand that there is a hacker whose intentions are far from decent. I am not claiming this to be a rule of thumb, but being involved in various market over quite a period of time, I have come to learn that traders and investors tend to follow short-term unorthodox indicators to guide their positions. In today’s case where the Middle East is the obvious stimulus for trading, I think the big traders and hedge funds are using oil futures as a trading indicator. Oil is down over $3 from its high while the developed markets are up sharply. The Asian markets were also higher. While I think the Middle East/North Africa (MENA) situation will take some time to resolve, global investor sentiment appears to have adjusted to the higher oil prices and the prevailing tension that has caused oil prices to spike. I think investors have come to accept that a prolonged MENA political upheaval will be the norm for sometime. This inclines me to believe that in the coming weeks, we will be building a base of support for stock prices here. The impressive spike in AEV yesterday, I think, is a one day event. I learned that there was one big player adjusting his large index fund to the inclusion of AEV in the MSCI Philippines. These things happen and makes holders pretty joyful. I for one am taking portfolio profits in the stock. As one of our readers had commented yesterday, you had a 17% gain over a few days, why not take the money and run. I remain in the mindset that you never lose money by taking a profit. While I am very cautious and am keeping my eye on an index level below 3700, I realize that cheap stocks are already abounding. (Actually my thinking is that a strong support for the market in general is to form a base at 3600.) Some readers commented on stocks like MWC, JFC and AGI. I think with these stocks, it will be simply a matter of timing now because they are intrinsically solid and are at levels commensurate to their earnings forecasts. I must add that these stocks have very stable earnings even if the economy turns. I think we are close to a point when we can cautiously position our favorites. On my part, I am likely a seller if this market moves a little higher, but because I have cash to spare, I wouldn’t mind accumulating should this market dip below 3700. Unless there is a dramatic shift in the global political tensions, I do not think that our market will be going anywhere in the coming days. It is really quite a pity considering the constructiveness that we saw in the last quarter of 2010. This only goes to show that we cannot underestimate the fickleness of markets. It seems that movement of crowds will always be the norm in stock markets which makes it an imperative that we have an insight on crowd psychology. When the inflation fear gathered momentum, there was no stopping it. I believe the fear will be among us for sometime more. Even the tension in the Middle East is a manifestation of inflation fears given that what embeds the anxiety of investors is the fear of oil prices sky rocketing as OPEC supplies get threatened by lower production. The developed markets while enjoying a bull run over the last two months is showing some signs of weakness. Of course the downward revision in US GDP estimates from 3.2% to 2.8% does not help the cause for equities world wide. Surely, strong domestic fundamentals in the Philippines will not affect global mindsets very quickly. Everybody is looking at the big picture, and, unfortunately with big pictures, small markets can hardly be seen. The key is for local investors to gain strong conviction on the fundamental values that domestic stocks present. A case in point is TEL. I must admit that while TEL has been cheap from 2400 and below, I have yet to be compelled to pick it up in spite of the impending cash dividend which is usually paid out in March. I guess I value cash more greatly today than I value even high yield stocks. It gets to be that way when you sense that the crowd will be against you. Timing is absolutely key to situations like TEL and my instinct tells me that it is not yet time. I think that sometime soon, conditions can become very attractive to a handful of TEL followers. Nevertheless, patience and careful analysis of the situation cannot be yet ignored. The markets around the world continue to react to oil prices. I noticed that the European markets, except for the Swiss, were not as badly sold as the previous day. The U.S. indices were off overnight but only slightly. As a matter of fact, the Dow transportation index was up 0.45%. The markets recovered when oil prices eased a bit. I will not hold my breath for oil prices to go down though. We are now living in a 100 dollar a barrel oil price scenario and prices of all commodities and goods and services will automatically adjust to that. I think that even if the Libya situation resolves itself soon, which I do not think it will, the anxiety of such sensitivity of oil prices to middle east politics will keep buyers inclined to keep stock levels higher than usual. That case can certainly be gleaned from China who in recently have tried to be ahead of the commodities curve. Anyway, my worst case scenario is a re-rating of GDP growth prospects downward. At year-end, I was of the opinion that the Philippines had a strong growth trajectory due to prospects of heavy investment spending through Public Private Partnership (PPP) initiatives. I have become less enthusiastic about the prospect because I think infrastructure investors will be more discriminating with the global scenario becoming less stable. I guess my message is that we should not expect a market recovery soon rather we should be open to the idea that this situation could languish for sometime. Some people may find it worrisome and perhaps a bit late to adjust portfolios. I reckon that if you have cash on your side, you may miss the first wave of a recovery rally, but you’ll still be able to find some bargains. My suggestion is to stick to fundamentally stong stocks which the market continues to favor. These are the power and related stocks like DMC (which owns part of Maynilad), MER, MPI, AP, EDC and MWC. The idea remains to be stability of earnings so you can throw in SCC in there also. If you get the urge to come in, I think you should stick to a narrow selection of highly tradable stocks without abandoning a trading mindset, at least not yet. We will be resuming our seminar series on Wednesday 2 march 2011. As usual, there will be snacks and refreshments. More importantly there will be a lot of food for thought. I am looking forward to lively discussion among those who come. If you have questions, write them down and pass it forward when you come on Wednesday. We will give it a shot. Gus is a consultant in one of the Philippines‘ leading investment houses. Having worked with global investment firms in Asia since the 1980s, he has extensive experience in the region’s financial markets. Now based in Manila, Gus focuses on Philippine investment markets – stocks, bonds and foreign exchange. Understanding that all markets are interconnected, Gus constantly follows the regional and international markets, hoping to bring to his readers a clearer picture of the Philippine markets in relation to the larger, global scheme of things.